This section is designed as a quick guide to common foot problems, and should not be used to diagnose problems or suggest how to treat them yourself. Hard Corns are deep plugs of hard skin which form in response to pressure on the skin. They are usually found under the metatarsal heads, heel or on the tops of toes where there is pressure from footwear, especially when the toes are deformed. Seed Corns are multiple, small corns which form on the sole of the feet. Soft Corns form between the toes when prominent bony areas rub together. 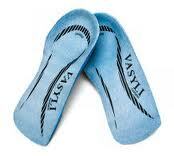 The sweatiness between the toes usually causes the thickened skin to become soft, white and rubbery. All corns can be pared away with a scalpel and pressure –relieving padding, toe separators and/or insoles used to prevent their recurrence, though in many cases they will re-form and need to be treated occasionally. Callus is a thickening of the skin over a wider area in response to shearing forces and friction on the skin. Callused skin can be painful and have a burning sensation. Treatment again consists of skilful paring away of the thickened skin with a scalpel. 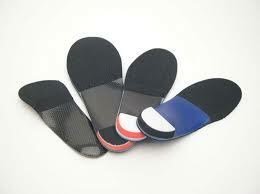 Callus can be prevented from re-forming by regular use of a foot file or pumice stone following podiatric treatment. The spores of skin and nail-infecting fungi and yeasts are found everywhere in the environment, and they will happily infect and live in the protein of toenails in their warm, dark, moist environment. This very common condition can cause the nails to become discoloured, crumby, thickened and loose. There are a number of approaches to treatment including the application of anti-fungal lacquers and taking anti-fungal drugs orally. Your podiatrist can advise you on your best treatment options and remove much of the fungally infected nail to give any treatment the best chance of success. Toe nails often dig into the surrounding skin, causing discomfort. Corns and callus can form in the corners of the nails as a result of pressure from the nail on the skin. Regularly cutting the nail back and clearing skin from the borders will relieve the problem, and packing the edges of the nails may also help. These problems are often associated with involuted toenails, where there is excessive curvature from side to side of the nail. 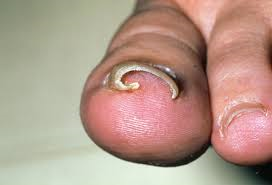 A true ingrowing toenail happens when the nail pierces the skin, causing severe inflammation and pain. The nail will usually become infected, and soft red hypergranulation tissue grows around the area. This usually occurs in younger people, especially teenagers, and is often the result of poor nail cutting or damage from sports. Removal of the nail, or just the ingrowing edge of the nail, is usually required. This is done under local anaesthetic (requiring two injections in the toe). The nail is prevented from growing back by applying phenol, a caustic chemical, to the growing nail bed. Without this the nail regrows and the problem often happens again. The foot is a complex mechanical structure which must cope with the strain of carrying the body’s weight when walking and running. Small misalignments in the foot, leg or higher in the body can cause significant and painful problems, such as joint and connective tissue inflammation and muscular strain. 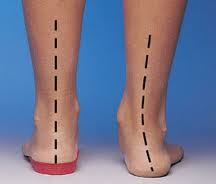 Knee, hip and back pain is often associated with poor foot posture and function. Insoles and orthoses are devices placed in the shoe to correct any deformities and help the foot to function more normally, relieving stress and strain on overloaded structures. These will be specifically prescribed and made for each individual. Simple ‘chairside’ devices are usually used initially, followed with a wide range of more permanent devices available to suit all needs. Stretching and strengthening exercises are usually part of any treatment regime, and other anti-inflammatory therapies. Biomechanical problems are often associated with sporting activity, which increases the stresses which the foot undergoes. These are very common biomechanical problems where the strong ligament along the sole of the foot becomes strained and inflamed. The whole ligament can be affected (plantar fasciitis), or just its insertion into the heel bone causing more localised heel pain. Treatment consists of specially designed cushioning and supporting orthoses, stretches and exercises and anti-inflammatory therapy. The feet are at increased risk of a number of problems in people who suffer from diabetes, even if it is considered ‘mild’. These problems may be very serious in some individuals with ‘high risk’ feet. It is important that all people with diabetes have their feet checked at least once a year, to assess the state of their blood supply and sensation, and to have any problems professionally treated. It is important that diabetics do not attempt any potentially harmful self-treatment, and seek help IMMEDIATELY if they have any concerns. Bunions, Hammer Toes and other delights! As we age, the strains the foot endures often cause a wide range of deformities, which may need treatment to relieve pressure, reduce strain and prevent further deterioration. A podiatrist can provide a wide range of treatment to help these conditions, and also advise and refer on for further orthopaedic opinion and treatment where appropriate. Self-Help and Foot Care Products. Podiatry aims to keep people and their feet as independent and problem-free as possible. To this end you will be offered extensive and personally-tailored advice regarding foot care which can be done yourself, reducing the level and frequency for the need for podiatric treatment if you wish to do this. Advice will be given as to which products will be most suitable for your particular needs.